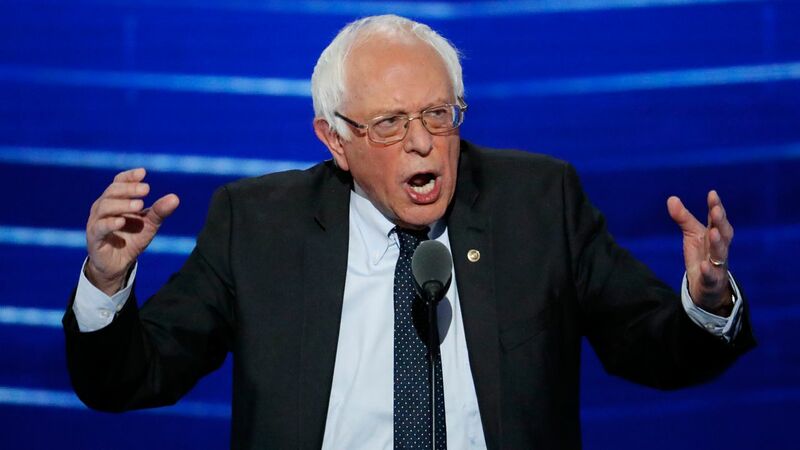 NEW YORK (WABC) -- Bernie Sanders went on an anti-Donald Trump rant during the first presidential debate Monday night, live blogging his thoughts on the issues discussed. But only one of his posts referenced his former competitor, Hillary Clinton. Sanders, a senator from Vermont who lost his presidential bid to Hillary Clinton in the Democratic primary, took to Twitter with 26 tweets during the debate. He sporadically used the hashtag, #DebateWithBernie. From there, his posts all directly mention Trump in some way or another. "I don't know if it's a world record but Donald Trump has been sued more than 3,500 times over the past 30 years," he wrote in his 11th post while the debate was happening.
.@HillaryClinton is right: Private prisons are a disgrace. Corporations should not make profits off the imprisonment of fellow Americans. Glad Trump is concerned about manufacturing jobs going abroad. He might want to start making his clothing in the US not low-wage countries. Trump’s tax plan includes eliminating the estate tax which provides a $353 billion tax break to the top .3% & $4 billion to his own family. Trump's proposals wouldn't just give huge tax breaks to billionaires they'd cut pell grants to make college affordable by $28 billion. Many of these lawsuits were filed by working class americans who worked for Trump and never got paid. Oh yeah, Trump will stand up for working people. 7 of his 13 top economic aids are Wall Street bankers. Just what the country needs more of. How dare Trump express concerns about African Americans when his birther efforts attempted to delegitimize @POTUS. What a hypocrite! The difficulty of discussions with Donald Trump is that he lies all the time. That's not my view. That's the view of media that covers him. NBC has documented at least 117 times Trump has switched positions on immigration to guns to abortion since he announced he was running. Trump wants more tax breaks for billionaires, won't raise the min. wage & denies climate change. This isn't someone who should be president. What did you think of his stream of thoughts? Tell us in the comment section below.